Color can dramatically affect moods, feelings and emotions. When it's time to set the color palette for a room or home, you should carefully consider the colors you want to use - from the ground up. Carpets give the widest range of choice when it comes to flooring. From deep blue to neutral beige, from dusty sage to patterned yellow - carpet gives you the most flexibility when it comes to setting the mood and tone of your space. Indianapolis carpet store Kermans has a few tips to consider when you're ready to pick your next carpet. What does the color of your carpet affect? Many of us probably don't spend a lot of time thinking about the color of our carpet. However, as one of the largest areas in a room, your carpet color affects you every day - even if you don't realize it. The color of your carpet can affect your mood, your thoughts and your energy levels. You might feel differently or work differently based on the overall color scheme of your space. Red is a warm color that can bring feelings of warmth. Depending on the brightness and hue it can also raise the energy level of a room. Orange is another high energy color that isn't right for every space but can bring an uplifting affect to a room where lots of activity takes place. Yellow is typically thought of as a joyful color and can be very energizing in open areas. As a warm color it is also welcoming and comforting - a perfect influence in an entry space or hallway. Blue is a cool color and is most often seen as calming and relaxing. Blue carpet could be the perfect choice for your bedroom. However, light blues can come across as too chilly and should be balanced out with warmer hues in furnishings. Green is both refreshing and cheerful - a good mix of the qualities of blue and yellow. It has also been shown to reduce stress. Purple is a rich and dramatic color often associated with luxury. In its lighter shades it takes on the role of a cool color while in its darkest shade it leans towards the warmth of red. Afraid of too much color in your floor? There's a reason neutral beige, browns, grays and whites are so popular. They are the most flexible color choice available allowing you to add color or subtract it with furnishings and accessories based on your preferences or even the time of year. Who will be using the room most often? What is the use of the room? Color trends will come and go. What makes a color perfect for your room is one that reflects your personality. Blend the colors that you like best and you'll have a home that fits your style and is welcoming to all who enter. 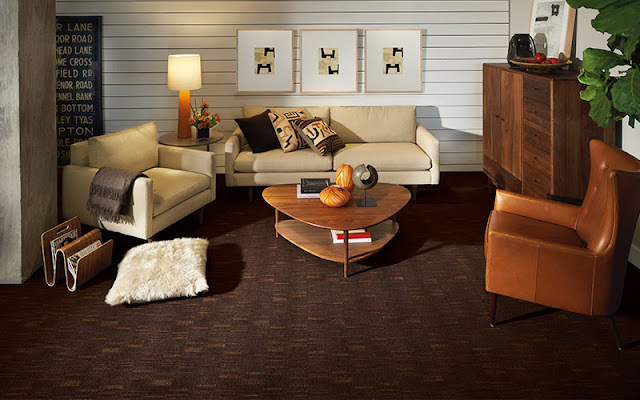 When you're ready to buy carpet, turn to Indianapolis' best carpet store, Kermans. We've been helping homeowners find just the right floor for decades and we look forward to helping you make the best choice for your home too.